Bates College will dedicate comprehensive renovations to historic Garcelon Field at midday Saturday, Oct. 9, as part of the Bates football team’s home opener vs. Williams College. The event, a centerpiece of Parents & Family Weekend activities at Bates, will include a brief ceremony prior to the 1 p.m. kickoff and a halftime program recognizing supporters of the $2.6 million donor-funded project. The public is welcome to attend the game at no cost. Live video streaming of the game will be available of the game. 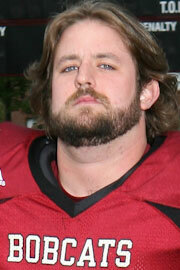 Bates (1-1) is coming off a 21-20 victory over Tufts, while the Ephs (2-0) defeated Trinity 29-21 last week. The project, started immediately after the academic year ended in May, comprises a new FieldTurf artificial surface that replaces the grass surface; a new aluminum grandstand for 1,500 fans that features stadium seats in the center section; a new and expanded press box; and four new Musco light towers providing nighttime lighting for the first time. The new Garcelon Field will offer space for varsity, club and intramural sports, including varsity football in the fall (and men’s and women’s varsity soccer during rainy weather) and, starting in late winter, men’s and women’s varsity lacrosse, with snow cleared by mid-February for the start of practices. Approved by the city of Lewiston on May 10 and by the Bates Board of Trustees on May 20, the project moved ahead swiftly during the spring and summer, as did fundraising: gifts and pledges to the project now total $1,819,010 toward the $2.6 million cost. 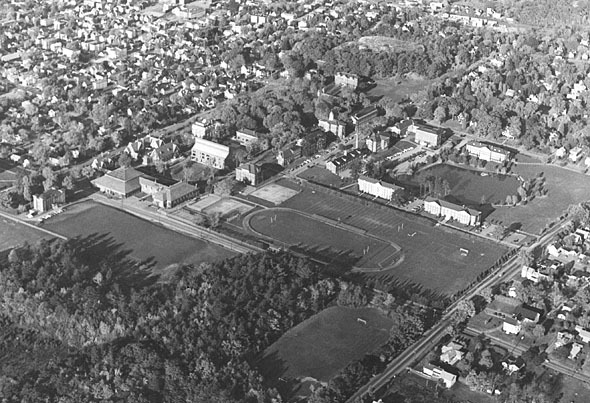 First developed in 1899, the Garcelon Field area has evolved from an athletics quadrant into a campus crossroads. As such, the renovated field reflects the distinctive “distributed model” of the College’s Campus Facilities Master Plan, which seeks to locate new facilities around campus in a way that weaves together informal and formal academic, athletic, administrative and student-life activities. 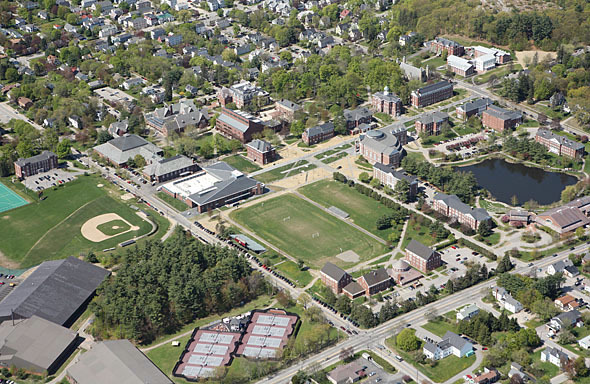 Near the football field’s north end zone is the Residential Village (1992), while Pettengill Hall (1999) is just to the west. The New Dining Commons (2008) sits a few yards from the south end zone, close enough that a net protects its windows from extra-point and field goal attempts. Nearby, two historic buildings of Garcelon’s vintage, Hedge Hall (1890) and Roger Williams Hall (1895), are being renovated and expanded for academic programs. “These projects reveal to our prospective students and their families Bates’ commitment to high-quality and well-integrated facilities,” Hansen said. Bates Trustee Steven Brown ’69, vice chair of the Friends of Bates Athletics, says that he and other supporters “look at the Garcelon Field project through the lens of improving Bates’ competitive position in a highly competitive higher-education market.” The historic field, while quaint, had ceased to be a selling point. The specific FieldTurf surface at Garcelon is Prestige Duraspine Monofilament that features synthetic grass-like blades that are cushioned, or “in-filled,” with sand and rubber granules from recycled tires. 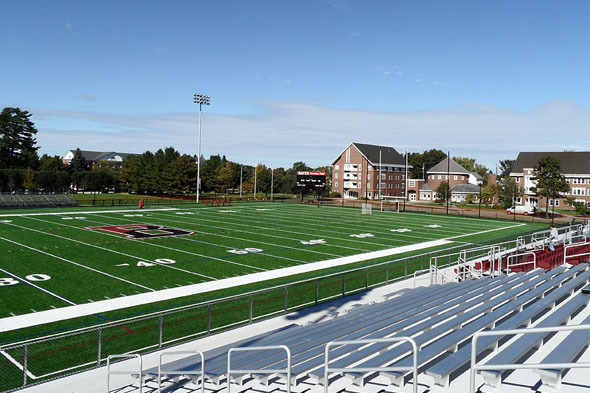 Bates is the fifth member of the New England Small College Athletic Conference to install FieldTurf for football, joining Trinity (2002), Middlebury (2008), Colby (2008) and Hamilton (2009). The general contractor for the project is R.A.D. 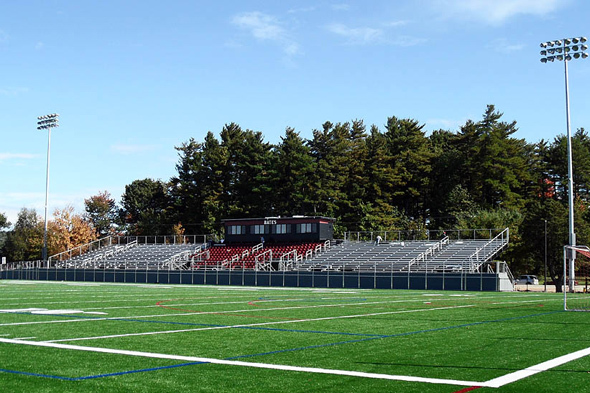 Sports of Rockland, Mass., with the surface provided by FieldTurf, Calhoun, Ga., a subsidiary of Tarkett Sports, locally installed by Northeast Turf Hue Inc., South Portland. The lights are from Musco Sports Lighting of Oskaloosa, Iowa, and the grandstand by Dant Clayton of Louisville, Ky., with the press box subcontracted by Dant Clayton to Mobile Facility Engineering of Cassopolis, Mich. The scoreboard is by Daktronics of Brookings, S.D. Maine-based subcontractors include T.W. Paving, Mechanic Falls (walkways); Pine Tree Fence, Litchfield (fencing); Favreau Electric, Brunswick (electrical systems); Longchamps & Sons, Lisbon, and Pike Industries’ Poland plant (aggregate materials); Dragon Products’ Lewiston plant (concrete); Almighty Waste, Auburn (demolition of the old grandstand); Irrigation Systems, Yarmouth (water systems); and S.W. Cole Engineering, Gray (materials testing). Garcelon Field is considered the 10th-oldest college football field in America. 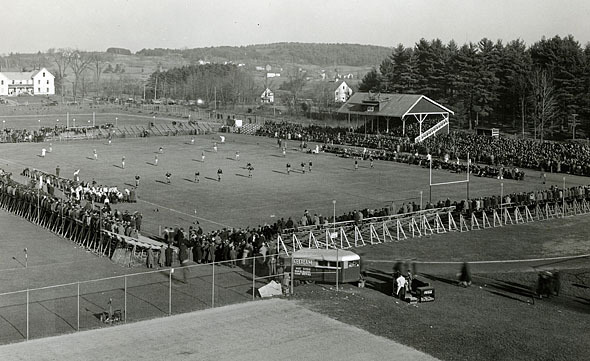 It was constructed with the help of students who wielded shovels and axes to turn a “rough uncouth pasture,” in the words of The Bates Student, into an athletics complex that at the time featured a football field, baseball diamond, quarter-mile track and tennis courts. 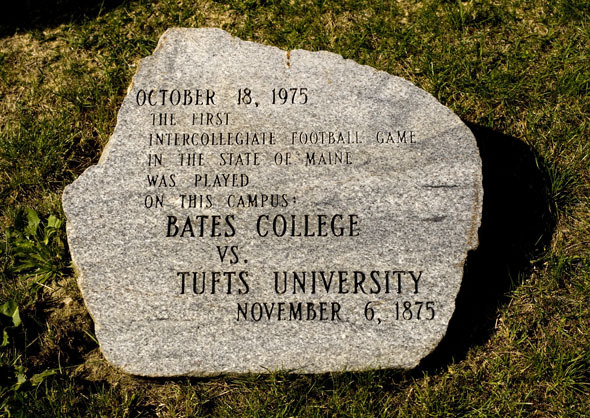 The first intercollegiate football game in Maine took place at Bates on Nov. 6, 1875, when Bates played Tufts University. Played on a field at the base of Mount David, the game probably looked more like rugby than modern football, as concepts like the line of scrimmage, down and distance, and the snap from center were still in the future.